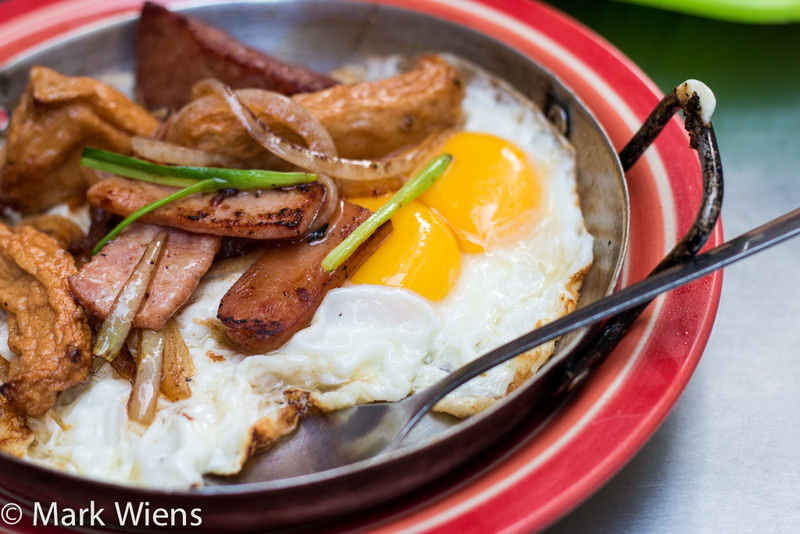 Eggs are a component of some of the world’s greatest breakfasts, and in Vietnam it’s no different. Just down the road from where I was staying in Saigon (Ho Chi Minh City), was a restaurant that served, what was probably the best breakfast I ate during my visit to the city, and ever in Vietnam. What is bánh mì ốp la? Banh mi, although the term is often used to refer to the famous Vietnamese sandwich, actually just means bread in Vietnamese. 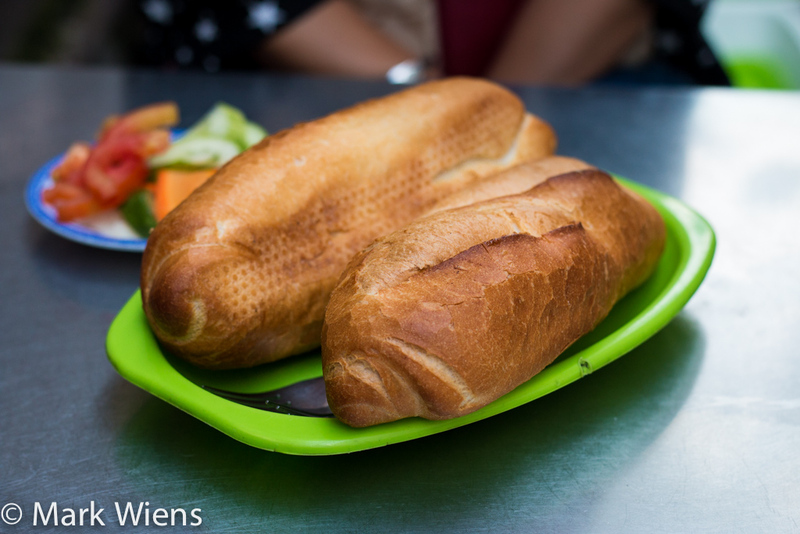 In Vietnam, banh mi is used to describe all sorts of different bread based items, but in this case, it’s usually used for the typical personal sized baguettes. Op la, a term that I believe originally comes from the French “oeufs au plat,” means sunny side up eggs. 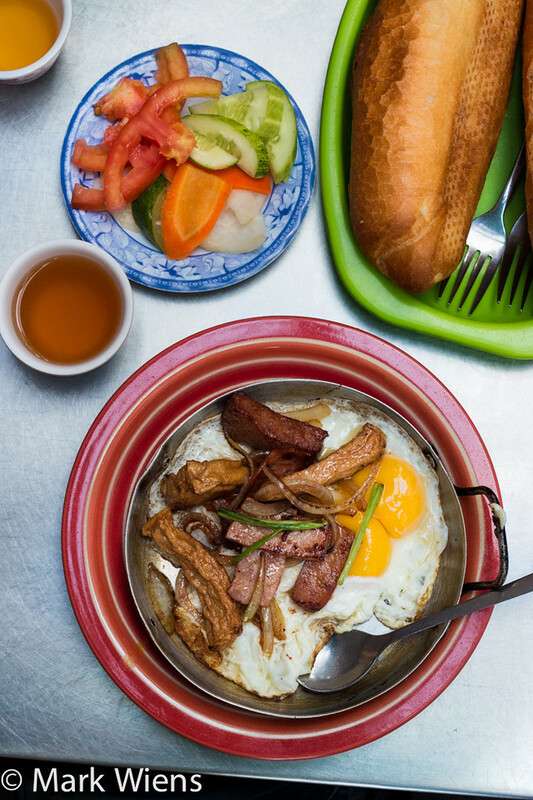 So all together, banh mi op la is the combination of a personal sized Vietnamese baguette served with eggs, often fried, and served in small personal sized pans. You can find banh mi op la nearly everywhere you go when you’re in Saigon, from street food vendors in alleys to indoor restaurants. One of the top recommendations, which many people suggested I try during my visit to the city, from asking on YouTube, was a breakfast restaurant called Bánh Mì Hòa Mã. One morning I got ready early, and walked over to the restaurant, eager to test their fried sunny side up eggs and baguettes. One of the things I immediately loved most about Bánh Mì Hòa Mã, was not only the delicious food, but also the location, and the atmosphere. Although the kitchen, and front part of the restaurant was located along the busy Cao Thang road in District 3 (I think, but really close to District 1), the tables and chairs were set up along a smaller perpendicular side street, where the atmosphere was a little calmer and more relaxing, yet always still exciting. Small red plastic tables, and little stools were set up in a line along the side of the road, and customers sat on the side of the wall, scarfing down breakfast with smiles on their faces. 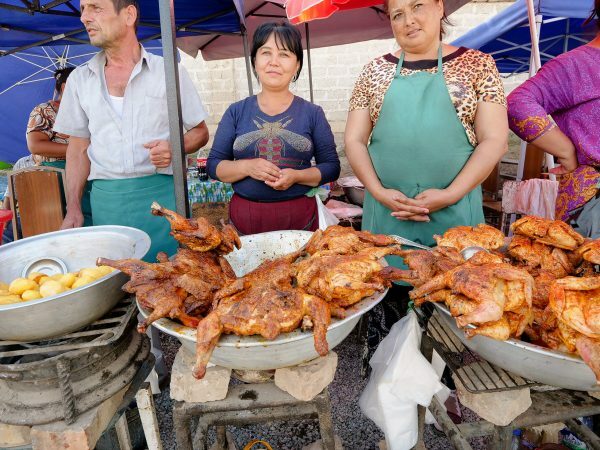 The street food atmosphere could hardly be any better in my opinion. I ordered the banh mi op la, and while I did also see that they offered a variety of sandwiches, this is the dish Bánh Mì Hòa Mã is most famous for, and what the majority of their customers, especially the ones eating there instead of taking away, order. When taking my order, the waitress asked how I’d like my eggs cooked, to which I replied, sunny side up, and she nodded with understanding and a smile. The duo of eggs were cooked on an extremely high fire, like stir frying Chinese food with the breath of the wok, except this time only with a small personal pan, and simply eggs. The result was that the eggs were flash cooked, seared on the edges, and soft and runny on the inside, including the yolks. I’m not sure how long they cooked the eggs, but I think only for a few seconds at most. 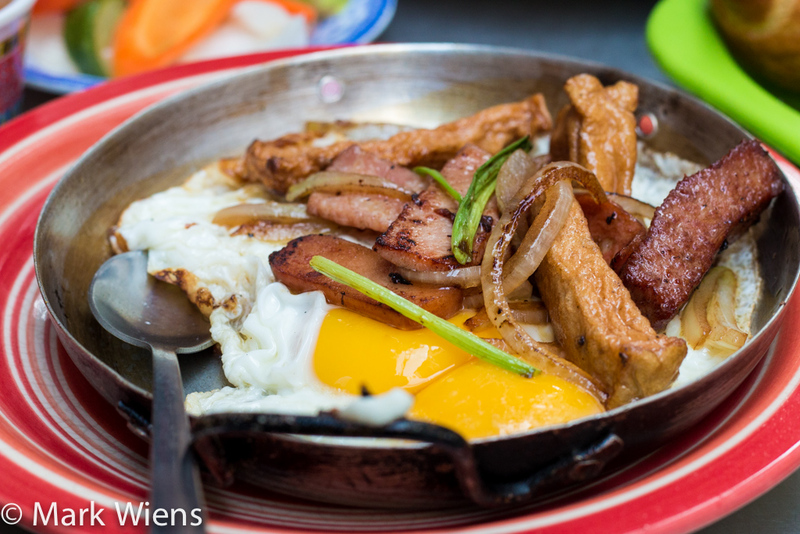 Along with the eggs, which covered the base of the pan, there were some slices of Vietnamese meats and Vietnamese sausage, which appeared to have been pan fried separately, before being tossed in an artful way onto the top of the eggs. Buy my favorite part of their op la, was the addition of sautéed onions, both white onions and green onions. The onions were slightly caramelized and smoky, giving the entire pan of eggs and meat an incredibly sweet oniony flavor. The waitress rushed our eggs down the side of the alley to our table, and I could literally hear the sizzle as it was whisked to down the alley. The Vietnamese op la was served piping hot, and my mouth watered as I anticipated my first bite. But before digging in, I reached for the bottle of black pepper, and added the only thing that could improve it more – the pepper. 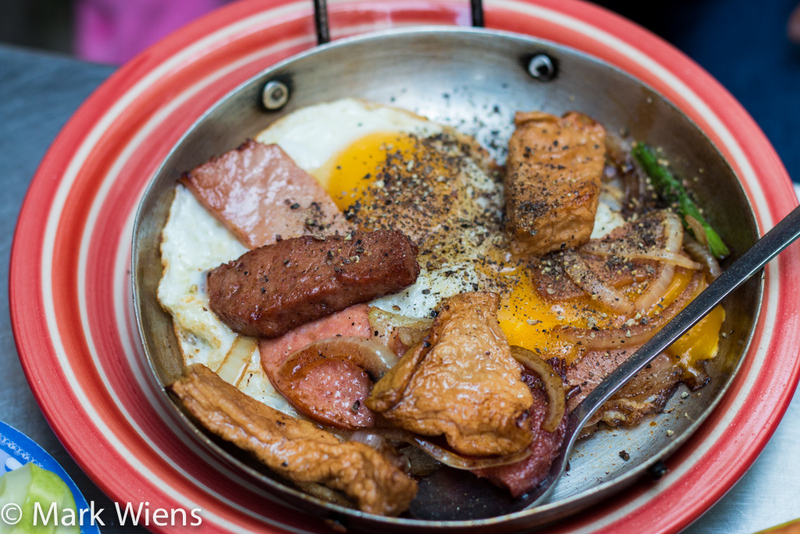 The eggs were cooked perfectly, runny yet slightly cooked on the edges, the meat tasted almost to me like SPAM, which I’m a huge lover of, and the caramelized onions added even more flavor to the already spectacular combination. The baguette, which you’ll see all over Vietnam, and you can’t go more than a few steps without finding, is a personal sized loaf. Vietnamese baguettes are usually extremely light and fluffy, yet on the other hand, extremely crusty and crunchy on the outside. When you break into a personal baguette, the crust flakes and the insides kind of collapse. They are very light and not too filling, but go extremely well with eggs or as the holder for a Vietnamese banh mi sandwich. I think the baguettes at Bánh Mì Hòa Mã were heated and slightly toasted to give them an even more crispy edge to go with the eggs. 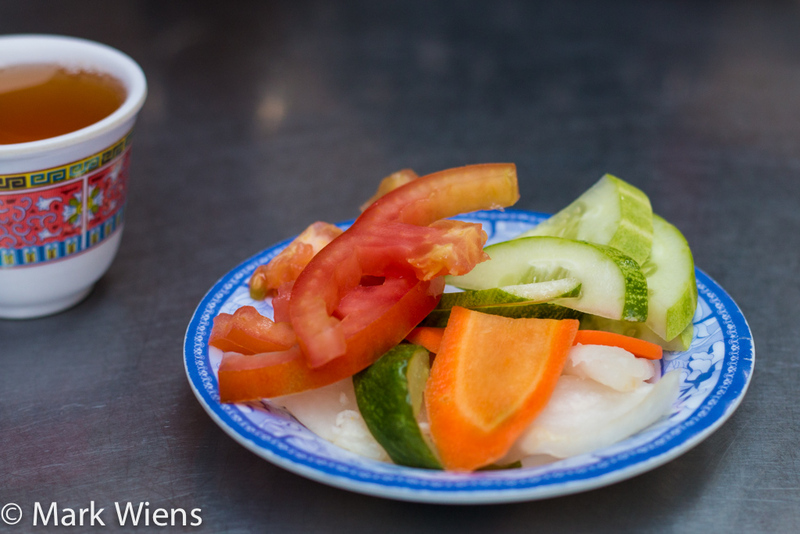 We were also served a plate of pickled vegetables, a nice garnish to break the richness of the eggs and greasy meat. 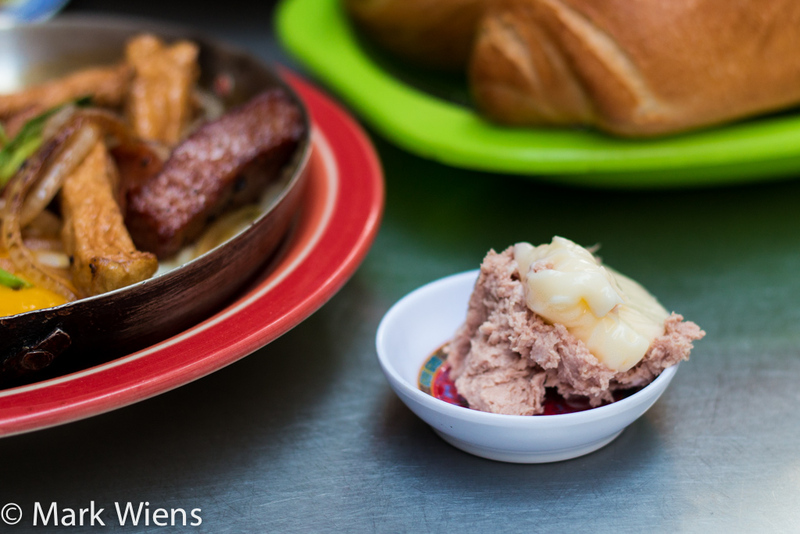 In addition to my personal pan of eggs and a Vietnamese baguette, I also decided to go the extra mile and order a small plate of pâté, an idea I got after researching further about this Saigon street food stall on Eating Asia. Though I’m not a huge fan of mayonnaise, which came stacked on top of the nice bowl of pâté, the pâté was excellent. For a few of my bites, I took a crusty piece of Vietnamese baguette, wiped on some pâté, then scooped on some eggs and pieces of meat – it was an absolutely mouthwatering experience. 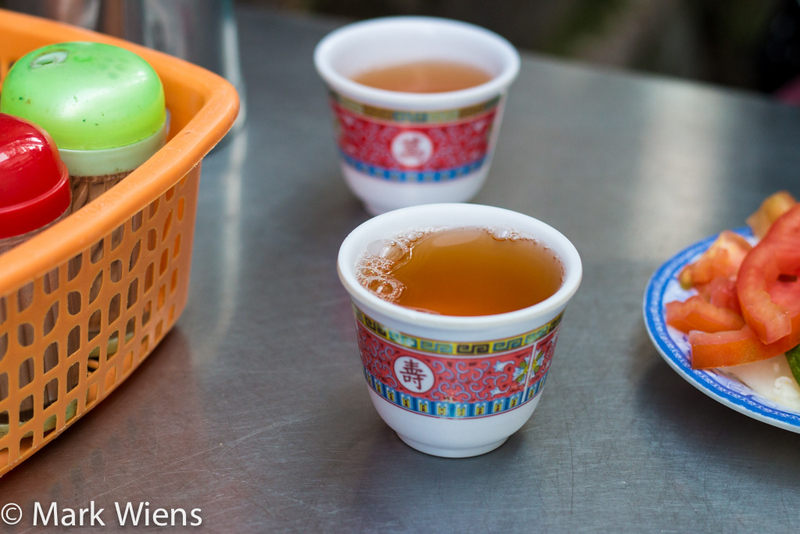 Hot tea, as well as coffee, is never far away when you’re eating a meal in Vietnam. 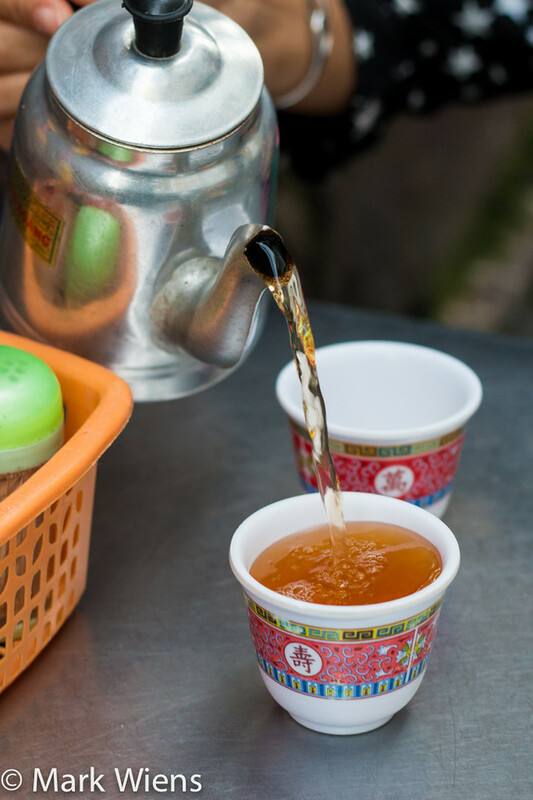 This time around, since I had already had coffee before coming, I just chose to drink the hot Chinese tea, provided complimentary at everyone’s table. Stomach happy full of eggs and a baguette, I sipped on hot tea, enjoying the beautiful atmosphere and just loving Saigon and the culture of eating in Vietnam. 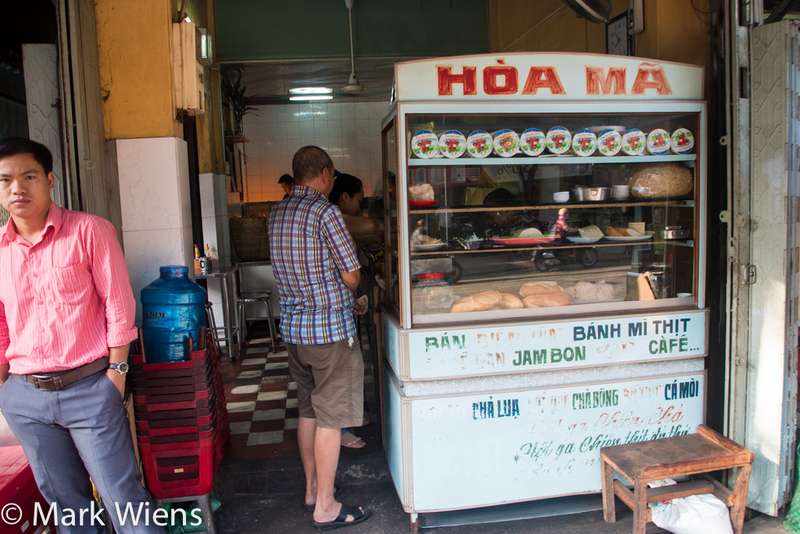 When I was visting Saigon, Vietnam, one day for breakfast I went to a well known restaurant called Bánh Mì Hòa Mã. 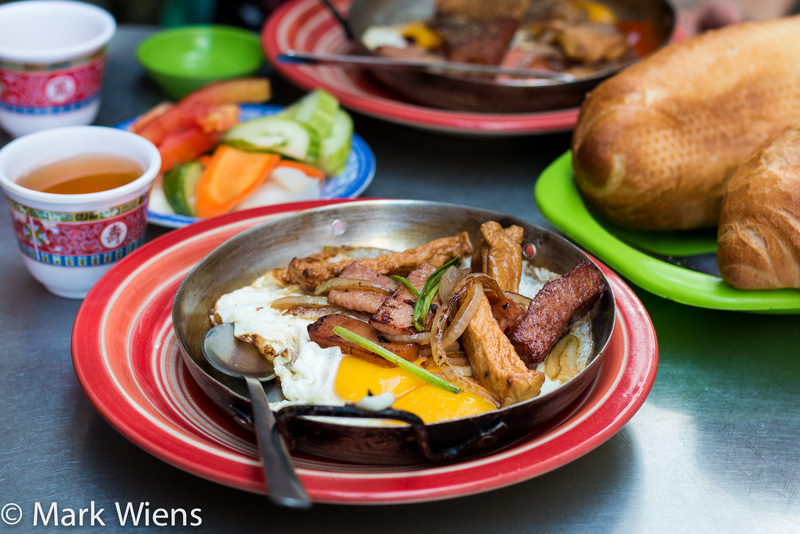 They specialize in Vietnamese banh mi op la, a dish of eggs cooked in a personal pan, and served with a crusty baguette. I loved everything about the restaurant, from the lively atmosphere and the seating along the side of the wall down a side street, to the perfectly cooked eggs, which had an incredibly smokey and rich flavor to them. The dish was so simple, yet prepared with such expertise. Eating at Bánh Mì Hòa Mã was for sure one of the best breakfasts I had when I was in Vietnam. You can’t go wrong with this place for breakfast. Open hours: 7 am – 10 am or so daily, I got there right at 7 am, and most of the tables were empty, but within 10 minutes they were full. If you go later you may have to wait for a table, but people eat and leave quickly, so it shouldn’t take too long. The restaurant is located right along Cao Thang road, on Hem 51 Cao Thang, just past Nguyen Dinh Chieu and across the street from this noodle stall. From Pham Ngu Lao, it would take about 20 – 30 minutes to walk there, or you could take a taxi or motorbike and get there within a few minutes. On the map, click on “10. Bánh Mì Hòa Mã” to see the exact location. 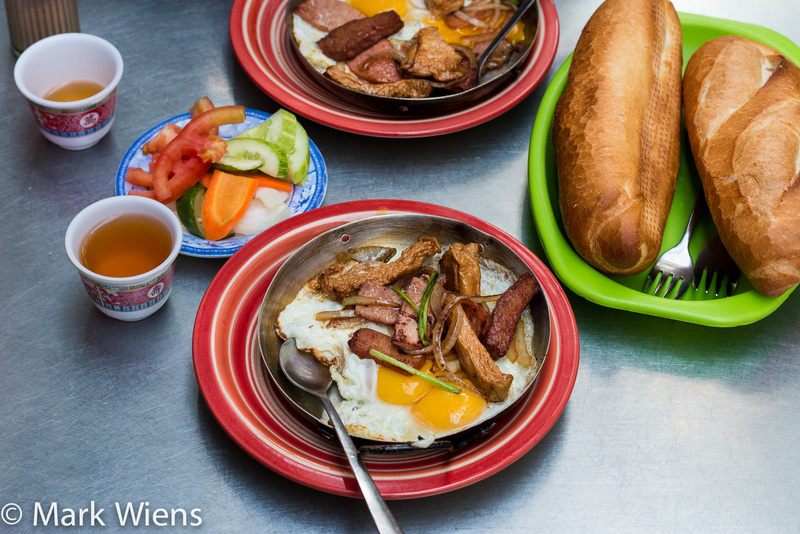 How would you like some banh mi op la for breakfast? Read about the history of this place. The family is credited as inventing or being one of the first to serve banh mi in the form we know it as today. Been there this morning. Still the same. Exactly as described above! I accidentally came across this place on an early morning walk from my accommodation off 51 Cao Thang street. The food was amazing, and your video really does it justice. I would recommend it too! Just make sure you get there early. From 7 am there are tables down both sides of the alley and then as the traffic starts to get busier the tables and chairs are just down one side. 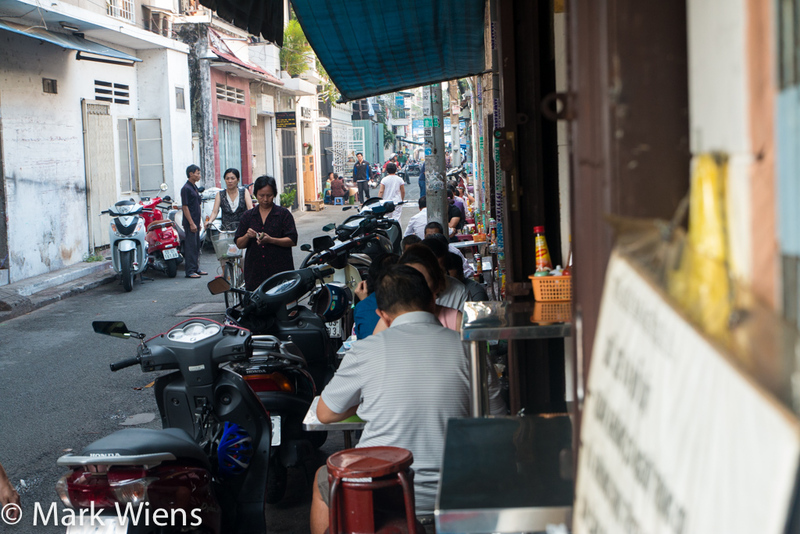 I now go here every morning for breakfast and pay anything between 36,000 vnd – 50,000. Hey Clare, great to hear from you and thanks for the updated report about this breakfast spot. Glad you enjoyed it! Me and my partner are going in February and just wanted to know what time do they close. I see the open at 7am but just curious so i know what time we need to get there for as I really want to try this. It looks so amazing. Hi Savannah, I’ve just arrived in HCMC from the UK. It opens at 7am, but I still managed to get served at 8.30am, although by this time the traffic was busier and the tables were only down one side of the alley, rather than 2. Given the choice I would go as early as you can, it’s cooler and there is less traffic. Don’t forget you are going to be sat outside down low on these stools and exposed to fumes from the traffic. I enjoyed the quieter early morning breakfast experience at this place. That is beautiful breakfast in Saigon. The mayonnaise that you refer is not mayonnaise. Is actually egg white batter with oil. Is very creamy and tastes is way better. Try it next time. And please keep up with more excellent video gob bless. Hah, glad you love that too Minh! Hi Mark – In Saigon for the next 10 days – so couldn’t miss the opportunity to try this place, we’re staying in District 3 right next to the park, so a 10 minute walk to this restaurant. Wow absolutely delicious, the bread is so fresh, and the eggs over easy was a real treat. So much fun to sit there on a Saturday morning and see all the mopeds driving by, and watch all the other customers. Hey Justin, cool to hear you tried this place. From you description I can still picture all those motorbikes whizzing past and those perfectly cooked eggs! Enjoy your stay in Saigon and enjoy the food. Hi Mark, watching your video I realised the mistake I did today. On my way back home, I got a nice loaf of bread, baked in wood oven, from a local baker and which goes perfectly with fried eggs. But never thought to get some eggs!!!! Big bad mistake!! I love your videos. I’m new fan of yours as I very recently discover you on youtube! Keep up the good work. Hi Georgios, great to hear form you, thank you for your support and for watching my videos, really appreciate it. Haha, that’s alright, next time you can get the eggs! Mark – Great review and information. Your Bangkok reviews were very helpful for our trip last year, and this year we are planning on a Saigon trip, so looks like your reviews of this place will also be very useful! Great images, it makes one want to eat up the entire portion. Quick question — what type of oil do they fry their foods in — I was just wondering. If you do not know it is not important. Hi Wafa, thank you very much, really appreciate it. I’m honestly not sure, but my guess would be either palm or soybean oil. Hi Mark.This breakfast looks so filling. Thanks for the food references. 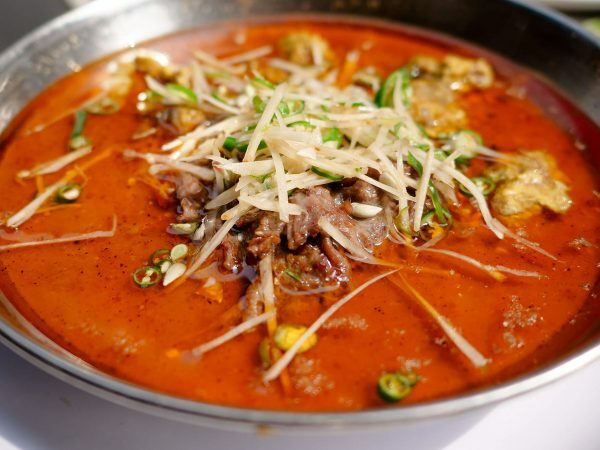 Can’t wait for my Vietnam trip in March to try these sumptuous eats. 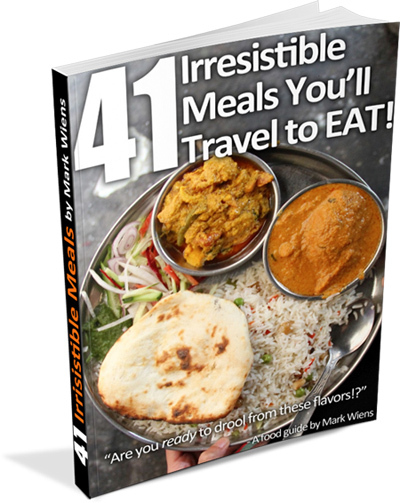 Been using your food and attraction guides in traveling especially those in Bangkok. So i’m looking forward to your “Things To Do” video in Vietnam soon. Hey Art, great to hear from you, thank you for reading. Hope you have a wonderful upcoming trip to Vietnam. Oh y entiendo el ingles solo que no lo hablo!! no hablo ingles, no se escribirlo pero se leerlo y desde que descubri tu canal en Youtube me encantan todos los videos que subes! Saludos y gracias por compartir todo esto !! This is a great post. I can almost hear the eggs sizzling as they hit the pan from your comments. 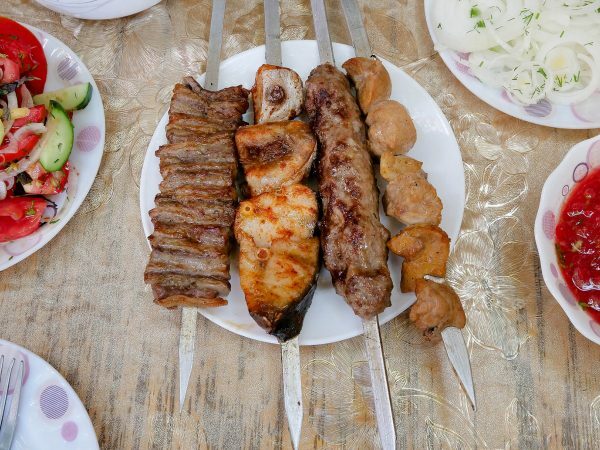 I will be in Viet Nam in the fall and have bookmarked this post for reference right now we are sampling the foods in Barcelona. Hi John, thank you very much, definitely check this place out when you’re in Vietnam. Enjoy the food in Barcelona. Great photos Mark! I eat banh mi often here in at my local Vietnamese restaurants. I had no idea it just was a term for bread, good to know. I also am not a huge mayonaise fan and always ask them to leave it off. Hey Nathan, thank you for reading, I too didn’t know that until going to Vietnam. Looks good, not the healthiest food on Earth but ok. It reminds me of something I had in China, on a street in Guangzhou. correct me if i am wrong Mark.. but what i love about the photos from this post..
Vietname streets look many times cleaner than they do in bangkok city!!! is this true? or was this an isolated incident! so many places to visit. so little time!! Hey Ray, good to hear from you. Hmmm, I thought they were about the same, though this particular place seemed to be quite clean, with nice shiny tables (although I was first to eat there, got there just as they opened), but overall, I think it was similar to Bangkok in hygiene standards. This looks so delicious! 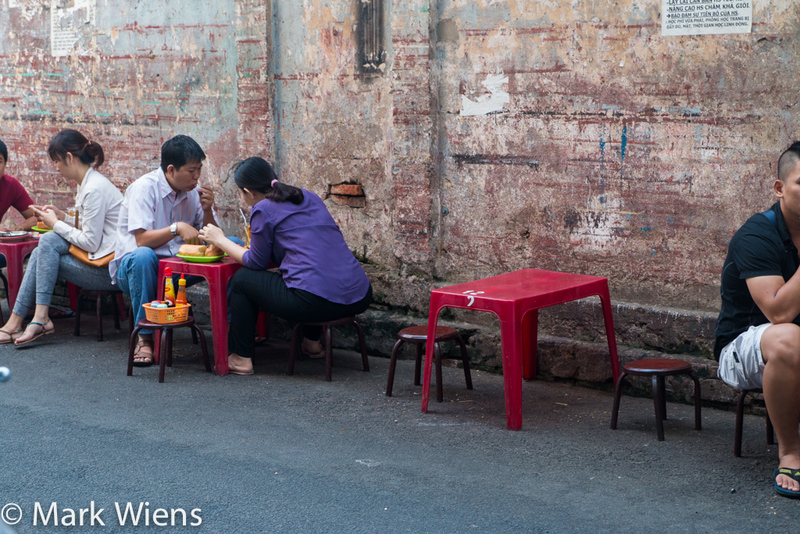 I had Banh Mi sandwiches for breakfast everyday while I was in Saigon and they were amazing. I’m craving one of those soft and crispy baguettes now! Hey Ashley, yes, nice to hear you had banh mi everyday, great choice. Thanks for reading this!